Your family will be begging for these melt in your mouth pancakes everyday! Grab the recipe so you can make your own this weekend. In my house, breakfast is my family’s favorite meal! Coming up with recipes that can become new family favorites is HUGE when it comes to breakfast food. 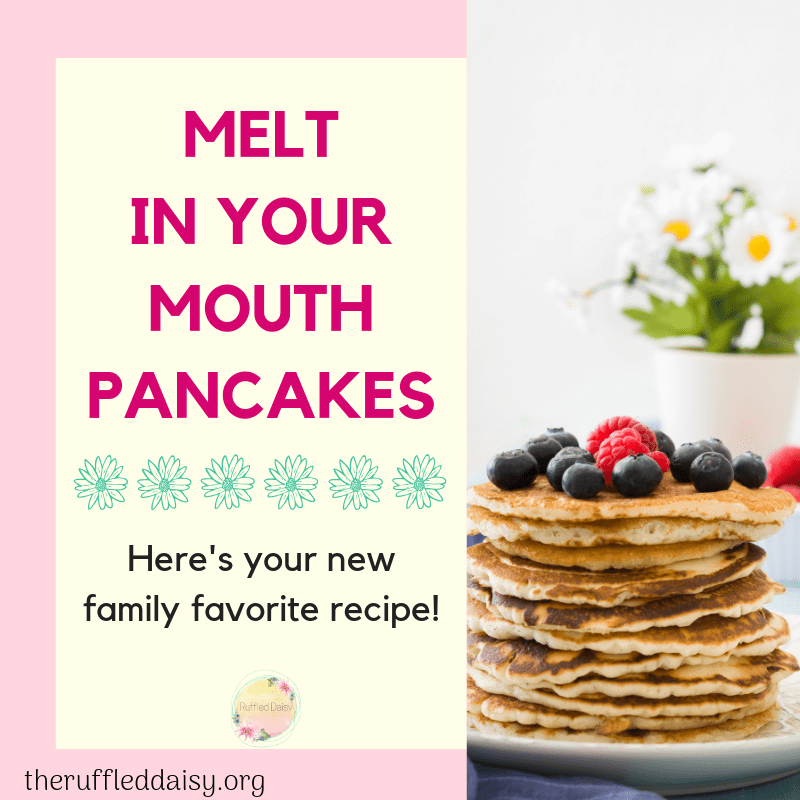 I’ve been on the search for awhile for the best pancake recipe that had everything my family wanted. Guess what? When you add kids to the mix…they all want something different and that can make cooking a challenge sometimes. These are the pancakes that your hubby and kids will ask for every weekend! Sometimes boxed pancake mix takes the cake, but in this case, there is no better recipe! The slight added sugar is what puts these fluffy cakes over the top! 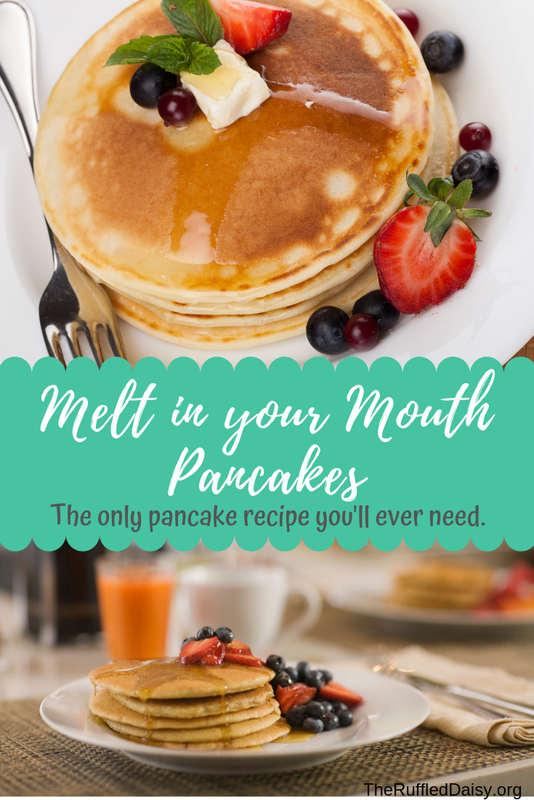 Here’s how you can make your own Melt In Your Mouth Pancakes! You might want to double the above recipe so that you have enough to freeze. You and your kiddos are going to want to munch on them throughout the week. * Freezer Tip – lay them on a cookie sheet without stacking and stick in the freezer until slightly frozen. Then remove them and stack them. Freezing them separately at first will keep them from sticking together. This is perfect for those mornings when you’re in a hurry or just want one or two. 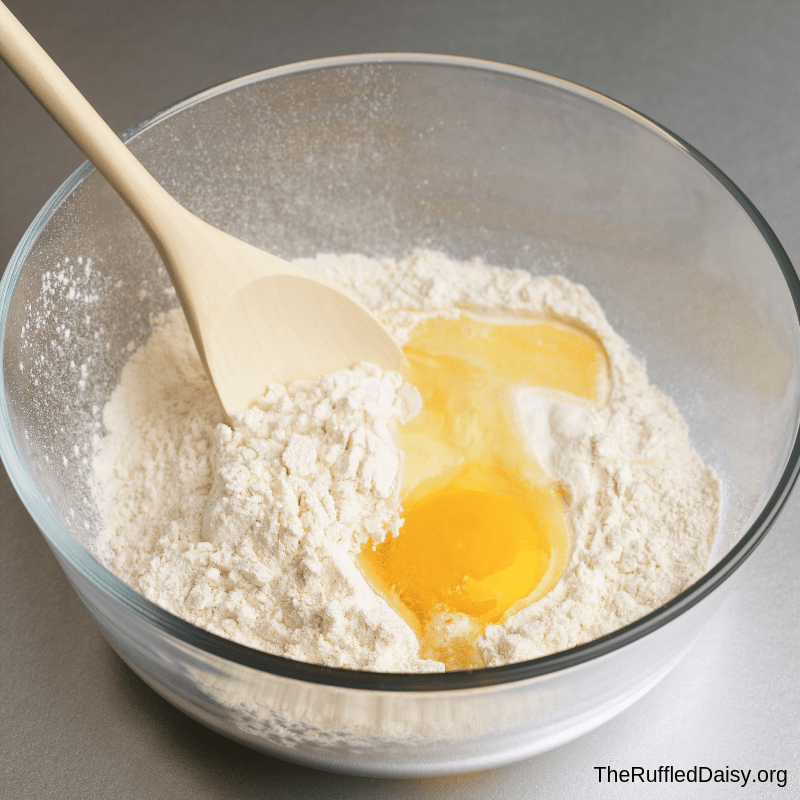 Just like any other pancake, mix all of the ingredients together gently. Over-mixing will cause the pancakes to be tough. 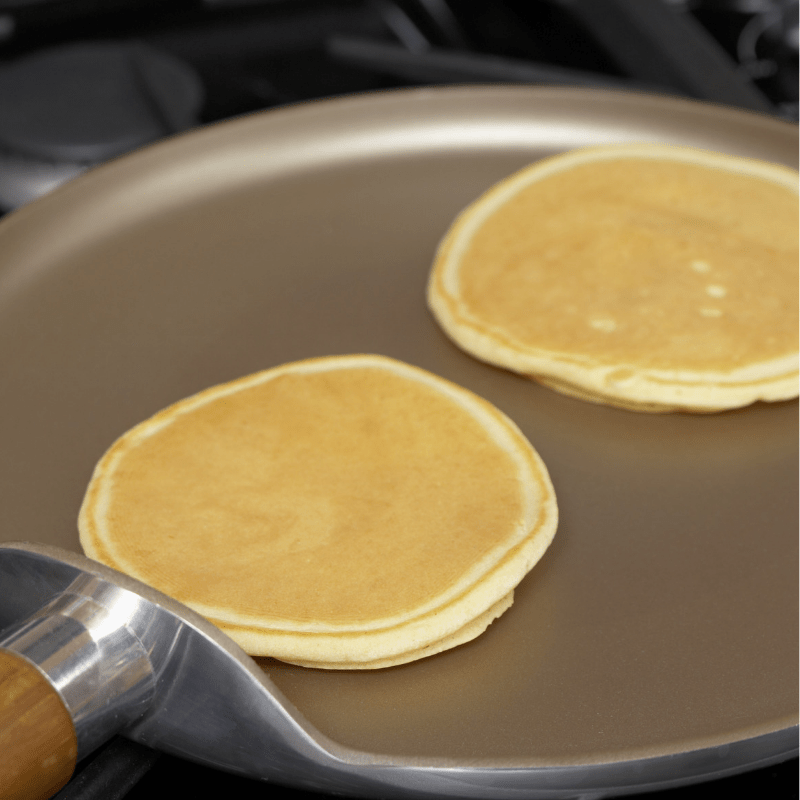 Pour 1/4 cup batter onto a hot griddle. Flip when the edges start to brown and bubbles start forming on the top. Cook to a nice golden brown and serve! These are heavenly when topped with powdered sugar, honey, syrup, or your favorite fruit! What is your favorite topping for pancakes? What do you think of these Melt In Your Mouth Pancakes? I’d love for you to share it with your friends on social media and PIN it so you have it for later! If you like what you see on this page, I’d love for you to join my mailing list HERE! When you join, I’ll send you my FREE Home Decor Holiday Printables that you can immediately download. Just my way of saying “thank you” and encouraging you to live your best life!! Let me know how it turns out! I am sure it would still be amazing. I’ve only cooked with gluten flour once and it didn’t change the recipe. Reminds me of the pancakes Grandma always made! Yum! I love brown sugar in my pancakes. I always add a touch of cinnamon too! I love pancakes!! I’ll have to try these this weekend! Yum, these look so good! Will have to try them this weekend!! These look delicious! Thanks for the freezer tip!